Madlib, Young Jazz Rebels, Kaija Saariaho, Isao Tomita, Gil Scott-Heron and more. This show was 59th in the global experimental chart. 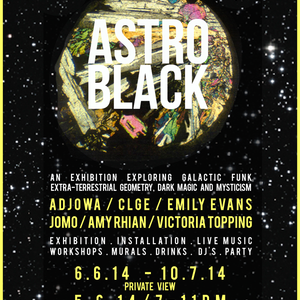 Presenting a special mix from team member Clge to get us in the mood for our first ASTRO BLACK COLLECTIVE LAUNCH NIGHT! wAHOOOO! We have teamed up with Printhouse Gallery to bring you a show stopper of an exhibition that takes you on a wild ride through the celestial plains! Not content with just hanging our prints on the walls, oh no, we&apos;ve gone and thrown in an installation, murals, live music, DJ&apos;s, workshops and the mother of all after parties at Dalston Roof Park to top it all off.